ForexNewsNow – Gain Capital is an international provider of online forex training services and technology. The venture is at currently operational in about 140 countries and has offices in multiple regions and jurisdictions. The company’s biggest brand is Forex.com which is one of the leading forex brokers on the market. Gain Capital was established in 1999 meaning and has been in business for 13 means meaning it had a lot of time to fine-tune its services based on experience and user feedback. The venture managed to become licensed and regulated by various major international online trading regulatory bodies such as the US Commodity Futures Trading Commission, the Investment Industry Regulatory Organization of Canada (IIROC), the Securities and Futures Commission of Hong Kong as well as the FSA in the United Kingdom and others. For the majority of its existence the company was a privately owned venture closed to the public stock market but in 2010 it decided to go public in order to acquire funds needed for further expansion. This however this didn’t achieve the expected results when 35% less money was raised than was initially expected. The latest development in the company’s history was the opening up to the Canadian online forex trading market. This will allow Canadian online traders to trade more than 70 assets and 50 currencies as well as numerous commodities, precious metals and agricultural goods. 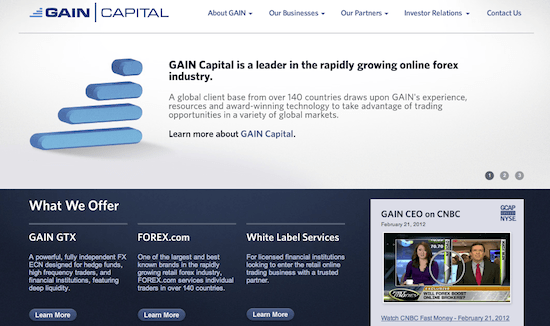 This will be possible though the Gain Capital-owned Forex.com broker website. The company and its Forex.com brand also became licensed by the Investment Industry Regulatory Organization of Canada (IIROC). This means it has the full backing and approval of a state-run body regarding the provision of online trading and forex services. Gain Capital has never been the top online trading company and forex broker in the sense of revenues. Most of the time the company’s revenues were moderate to high and on a level that sets the venture apart from the vast majority of brokers active on the market. For example, from April to June of 2012, the venture registered a net revenue of $45.7 million. This places the organization in the top 5 list of best performing US forex brokers for that period, but still doesn’t secure the leading position. Likewise, this sum is 3% lower as the one recorded in the same period of 2011. The total retail trading volume of the venture during this period was of $340.8 million compared to $357.2 million in 2011. The total institutional trading volume was of $442.5 million compared to $97.4 million in 2011. While a decrease is noticeable, these numbers are still extremely large and are on the higher end of the scale for US retail forex companies. Gain Capital runs three services. The first one is Forex.com which is a leading forex broker on the market. This is followed by Gain Securities, which was designed for individual investors wishing to trade options, stocks, mutual funds and other similar products. The last one is Gain GTX which was designed for financial institutions and hedge funds and will provide a fully anonymous trading environment. Forex.com is the main product and subsidiary brand of Gain Capital. Forex.com is a leading online forex broker that provides advanced services and trading options to traders in more than 140 states and jurisdictions. Forex.com uses three platforms which are Forex Trader Pro, MetaTrader 4 and its proprietary Gain GTX platform. The first two platforms are designed for casual or beginner forex traders while the last platform was designed for professional traders. New traders can work their way up first trying out the first two platforms and after gaining experience it’s recommended they use the Gain GTX platform due to the advanced features available. Forex.com always strives to provide low spreads and execution times. Examining this aspect closely it can be concluded that this isn’t just an unfounded claim since executions times and spreads are indeed lower at Forex.com than at other brokers. Yet, traders should not expect anything extravagant either. These features are certainly some of the best on the market but there are other companies that are on par with Forex.com in this regard. Overall Forex.com is indeed a top online forex broker. It offers a large selection of currencies and advantageous trading possibilities. The services are definitely much better than what’s being offered by the majority of brokers but nothing out of the ordinary that’s not available at some other big brokers. The proprietary Gain GTX platform is however a huge plus. Gain Capital is definitely a major online trading company. During its history there have never been any incidents that would compromise the reputation of the venture or its services. The only so-called “incident” might be the venture’s failure to acquire the initially estimated funds when it went public in its 2010 IPO. Stats also show that the company’s revenues have dropped in the second quarter of 2012 but only with a very small percentage. The venture is still on top of the list of the best-performing financial companies and brokers.